This week’s topic: “The Most Common Video Mistake”. Hey, pussycats. Janet Beckers here with your Cool Cats video tip of the week. Today I’m having a look at one of the biggest mistakes that people make when they’re looking at implementing video in their business. You know what? I reckon this is the one that the majority of people are making, and it’s why they’re not connecting with people, and they’re watching their competitors get the success and get the clients that they should be getting. Let’s have a look at what that is. The biggest mistake that I see people make, is they just don’t start. They are waiting until they lose ten kilos, or particular zone. They’re waiting until they’ve got a new hair style, or they’re waiting until they’re more of an expert. They’re waiting until they know more. They’re waiting until whatever. They’re just waiting, waiting, waiting. They’re waiting to get the perfect studio. 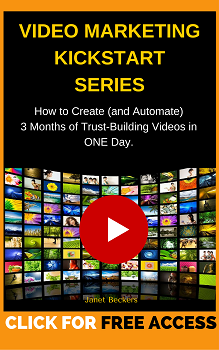 There’s always a reason why people are putting off using video in their business. The thing is, while you are putting it off and you’re not doing it, you are losing the opportunity, because video is here to stay. Video is growing. While you’re not doing it, your competitors will be starting to use video. They are going to be building the connections with the people who you could be building the connections with. Instead of you developing a trust and a rapport with the people who need your help, you are hiding behind procrastination, while somebody else goes out there and is helping them, instead. Is this the mistake that you are making? Are you putting it off, waiting to get it perfect? Waiting to afford the perfect camera, or waiting for whatever it is that you’re waiting for? Are you doing that? If you are, you’re letting people down, because they’re not getting to connect with you. That’s my biggest issue that I see. I’d love to hear from you. What’s stopping you from using video? If you are using video now, what was it that stopped you in the first place, and what changed, so that you got going? I’d really love to hear back. If you want some help to be able to get your message out there, I’ve got some wonderful free training for you, and you can get that. I’ve got a free checklist that’s really, really quick for you to look at, a one-page checklist. It’s my Video Leverage checklist. It’s going to show you when you’ve got a video, the potential that you’ve got, to how many people you can reach. 33 different ways that you can repurpose it. That’s there, waiting for you. I’d love to hear from you. Please leave your comments down below, and share this video with somebody that you’re thinking really needs to hear this message. Okay? Bye.